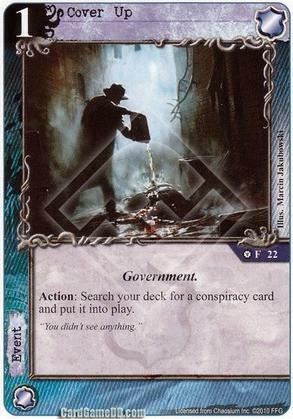 Flavor Text: "You didn't see anything." I'm currently running 3x this card in a deck built around The Blackwood Initiative. For starters, Cover Up lets me bypass the exorbitant 2-cost of the Initiative, allowing me to spend more of my resources on better characters. Better yet, the Initiative is only useful so long as the opponent needs to play resources. If I go first and draw Cover Up in my opening draw, I can fetch and put Cover Up into play before my opponent has even gotten a chance to take a turn. And I still haven't even drained my 2-resource domain yet. If I'm lucky enough to also have a Thule Zealot in hand, my opponent is way behind before he even started. Cover Up isn't for every deck, but in a deck like the one I described above, it's money.